The core idea is to create a program to help entrepreneurs launch new ventures and to use this program as a learning vehicle, initially within the MBA curriculum. The model is a little different from the standard pedagogic model, so there are some dangers of misunderstanding. Program: The Program itself is a structured set of business activities with a supporting set of people and tools whose aim the successful launch of a new venture. Entrepreneur: In this document, ‘entrepreneur’ refers to the individual or individuals who are committed to the venture and intend to pursue it as their job. Project: In the terminology here, a project is a business idea being pursued by an entrepreneur. In most cases, the core of the project will be some technology around which the business concept and company are built. A successful outcome would be for a project to become a funded company at the end of this sequence. In that case, the project will create one instance of each course. Of course, many projects will not turn out to be successful, and work on them may be terminated at the completion of any one of these courses. Indeed, it is the intention of the program to hold ideas up to very critical scrutiny and terminate them when that seems to be the right decision. Student: Students are interested individuals at Fuqua or at other schools at Duke who are registered for one of the courses in the sequence. Their work will advance the project and they will receive course credit. Students may enter the sequence at any point. In this respect, students are different from the entrepreneur, who is assumed to stay with the project through the entire program. Instructor: The instructor is a Fuqua faculty member who will be ultimately responsible for evaluating the work of the entrepreneur/student team and assigning a grade. Advisor: An advisor is a business person who will serve as a mentor for the team or as a subject matter expert available as a resource. Under the idea proposed here, an aspiring entrepreneur will be matched with a promising technology or business idea. That entrepreneur will supply the commitment and driving energy to the project. Other students will be attracted to or recruited to the project as it progresses through the stages of development. These entrepreneur/student teams will enroll in the appropriate NV course, complete a piece of work and receive credit for their work. Assuming a positive outcome, the project will move to the next stage (next course in the sequence). The same entrepreneur with a possibly different set of students will enroll in the next course in the sequence, and so on. A number of programs at Duke provide complementary capabilities. 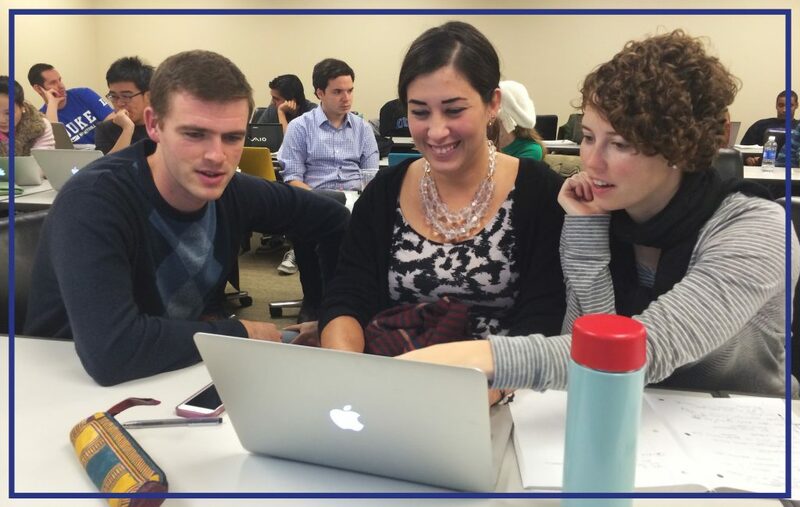 Duke Law and Entrepreneurship: The partnership between Fuqua and the Duke Law School provides opportunities for Law School students to earn course credit for working on entrepreneurial projects. In addition, P4E projects can avail themselves of valuable help with intellectual property issues as well as a variety of other legal issues. For students enrolled in NV 1 or 3 in the Fall, please see the Fall schedule on the navigation bar. For students enrolled in NV 2 in the Spring, please see the Spring schedule on the navigation bar. Key to the success of the program will be identifying and recruiting the right entrepreneurs to participate. Entrepreneurs will include graduate students from across the university. Teams will be supported by undergraduate students and advised by faculty and industry mentors. A second key to the success of the program is that the entrepreneurs work on projects that truly have the potential to be the foundation of new companies. The Program for Entrepreneurs is open to innovations and business ideas from any source. We expect that early ideas will come from research efforts at Duke or from business ideas created by the entrepreneurs in the program. It is worth noting that, despite “business” terminology, this program can equally be applied to social entrepreneurship. The structure and process of the Program for Entrepreneurs will evolve with experience, and will be flexible and responsive to the needs of the entrepreneurs or the particular project. Commercial assessment: Market and technical feasibility. The objective of this phase is to determine whether the new business idea is worth pursuing. Business plan: Business model, strategies in key functional areas. This phase should produce a fundable plan for the venture. Company launch: Financing, company formation, initial team, board of directors and advisors. In this phase, the venture will graduate from the program and become an independent company. 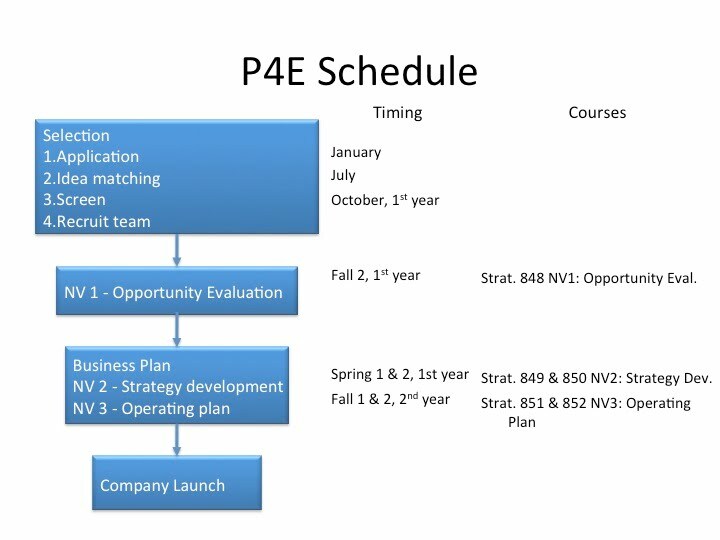 Although we expect project schedules to be idiosyncratic, an ideal scenario would be as follows: project identified and described prior to class enrollment in the Fall; commercial assessment concluded by May of the following year; business plan completed by December; and company established with seed funding by May of the following year. The Program for Entrepreneurs is a collaboration across Fuqua faculty and staff and business people affiliated with the school. The Fuqua personnel include regular faculty and executives and/or entrepreneurs-in-residence. The team includes entrepreneurs, investors and other professionals who are within the school’s network. Thus, the Program exemplifies academic/practitioner collaboration. The Program for Entrepreneurs will be program of study associated with an MBA degree curriculum. Students will get credit toward their MBA for much of the work done toward starting their ventures. Over time, we can explore how this program might be structured as an adjunct to other post graduate degrees offered by Duke University. The courses in the sequence of courses constituting the Program for Entrepreneurs are practicum courses. It is suggested that students taking courses in the Program for Entrepreneur sequence not enroll in other practicum courses in Entrepreneurship. Other Entrepreneurship courses that are taught on the model of readings and cases should be complementary to the Program. Examples of such courses are Entrepreneurial Finance, Entrepreneurial Strategy and Entrepreneurial Execution & Planning. Students in the Program should be free to take these courses as they fit into the objectives of their education. It may be appropriate in some cases to advise students not to focus their MBA programs too narrowly. In keeping with Duke’s mission as a research institution, the Program for Entrepreneurs will be closely tied to research by faculty into entrepreneurship. The program is founded on the belief in the close intellectual tie between the fundamental research questions in entrepreneurship and the basic issues of entrepreneurial management. The program will represent a unique synthesis of managerial and academic perspectives. To define a data collection model that derives from the critical management issues. Building a solid and capable infrastructure will be key to the success and ability to scale of the program. This infrastructure will comprise an online database for housing important process and project information, a process engine to maintain discipline in the project-related activities, a dynamic textbook in Wiki format to articulate the logic behind the process steps and decisions, and platform for communication among the various members of the community. The information and data from the various projects will be available for later study. We expect that Fuqua will receive some form of compensation in the case where companies are launched successfully. This may be in the form of a small equity participation if this is not problematic, or it may be in the form of repayment of tangible support given to the entrepreneur. To the extent possible aspiring entrepreneurs in this program should work on their business ventures continually while pursuing their MBA degree (except during the Global Institute). The program must be flexible to adapt to the specific needs of individual ventures. Student entrepreneurs in this program will be enrolled in one experiential course during each term (except the Global Institute and possible Fall 1 of their first year) to conduct work on their venture. In general, other students will be teamed with the entrepreneur to produce the relevant deliverables and receive credit. So the maximum number of credits a Fuqua student could receive for the New Venture Creation course sequence is 24. The concept is that at each stage, the student entrepreneur and the Fuqua oversight team will jointly determine what the next set of milestones are for the venture. These milestones will be translated into a set of deliverables, which will define the work to be done during the next one or two terms. The Fuqua oversight team will also assign a mentoring team to supervise the creation of the deliverables. At least one member of the mentoring team will be a regular Fuqua faculty member, who will be the person assigning a grade for the work. The integration of the academic and practical dimensions is unique among entrepreneurship programs and positions Fuqua to become a leader in entrepreneurship programs. The program will allow Fuqua to attract a handful of creative, energetic students who will enhance the Fuqua experience for a broader set of students (and faculty). The program will attract the interest and involvement of entrepreneurs, venture capitalists and others to Fuqua. For guidelines concerning conflict of interest and confidentiality, please see Governing Guidelines.